Time to warm up to the season. Okay, fall and winter are the chillier months of the year, so unless you live in the warmer climates, Mother Nature isn’t so warm and cozy right now. What you can do is warm up your interior. 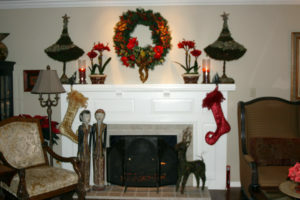 Yes, by turning on the furnace or the fireplace when its cold, but you can make your home interior “feel” warmer just by the way you decorate it. Look out your window and take inspiration from nature’s color pallet. Bring the beautiful and warm reds, oranges, purples, golds and yellows inside as you accessorize your home for the season. You will probably unpack blankets and pillows, why not add woven or chenille throws, in fall colors, to your sofa or bed? Bring out your fall decorative pillows and add them for another punch of color as well as comfort and warmth. Don’t forget to warm up the floor too. Now is the time to put down a great area rug for both visual and actual warmth. Most people will get out a bigger rug in the front and back entry to catch the ice and salt from shoes. Give a warm first impression in your home with a rich deep jewel tone–extra bonus, the dark color will show less dirt. Throughout the house you can add area rugs. Try a fluffier bath mat, put a nice warm-toned rug next to the bed for something warm to step on as you get out of bed, if you have wood floors in your home, think about hallways and larger rooms to fill with warmth. Do something fun and fashionable and get yourself a great pair of slippers to match your favorite blanket. Welcome holiday guests with hints of warmth. The smell of autumn potpourri and candles is a welcome, sensual layer in any living space. Greet visitors at your front door with a fall decorative wreath. You can keep it up all season just by adding a bow for the holidays. Layer your window treatments over blinds or plantation shutters. The additional fabric adds insulation and gives a “cocooning effect”. Be sure and use this time of year to change your bed coverings to winter colors and fabrics. Who doesn’t love to jump into fresh flannel sheets on a cold winter night? If you try any or all of these suggestions, you will have created a brand new living environment to enjoy! The interior designers at Pegasus Design Group would love to help you decorate your home for fall and winter. Contact us to learn how we can work with you to warm up your home.